This post was sponsored by Fresh From Florida as part of Influencer Activation for Influence Central. All opinions are mine as always. The weather is warmer and we can be outside more! I look forward to outdoor celebrations and cooking for friends and family. Summer barbecues are always fun and delicious. While we enjoy the sunshine, a plate full of colorful, locally grown food is always delicious and makes me feel better about what I am feeding my family. From local farms to our kitchen tables, Fresh From Florida and the Florida Department of Agriculture guarantees fresh and delicious food that makes every recipe a winner! 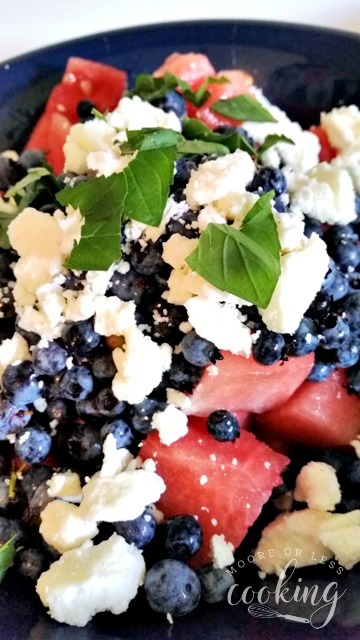 Fresh From Florida Watermelon and Blueberries inspired me to make this healthy and delicious Watermelon Blueberry Mint Salad. Perfect for a Memorial Day or a 4th of July cookout side dish. It’s a light and refreshing salad, perfect for the warmer weather and just tastes like summer to me! Plus, it can be made in under 10 minutes! I am inspired by healthy and wholesome meals with nature’s finest ingredients for my whole family to enjoy that are locally grown in the wonderful state of Florida. I love being able to shop locally in Florida, from farm to table. Watermelon, Blueberries, Tomatoes and Sweet Corn and seafood are my favorite ingredients to purchase during the summer season. Buying local and organic from farms makes me feel better about what foods I am serving my family. This light and sweet salad with fresh watermelon, blueberries, mint and feta cheese with a light dressing is perfect as a side for a BBQ Party. Toss the watermelon and blueberries together in a large bowl. Sprinkle the cheese on top and season with olive oil, lime juice and black pepper. Sprinkle the mint leaves over the top of the salad as a garnish. What is your favorite way to eat Fresh From Florida Watermelon and Blueberries?